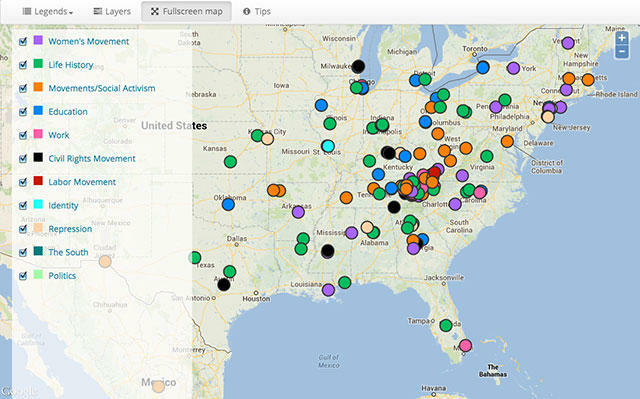 The Southern Oral History Program mapped oral histories with DH Press in their project Mapping the Long Women’s Movement. Researchers at the University of North Carolina at Chapel Hill have developed an easy-to-use website-building tool that puts previously complex digital programming into the hands of historians and researchers. The new tool, called the Digital Humanities Toolkit or DH Press, provides a way for historians, researchers, teachers and others to create interactive websites, virtual tours, data maps and multimedia archives with a WordPress platform. It also organizes data in more easily searchable and intuitive ways, such as mapping. UNC-Chapel Hill’s Digital Innovation Lab (DIL) and its Renaissance Computing Institute (RENCI) collaborated on the new tool. UNC’s Southern Oral History Program created a pilot project with DH Press and called it “Mapping the Long Women’s Movement.” It places the oral histories of hundreds of individuals onto a US map and allows users to search through the audio files with key words and themes to find stories more easily. DH Press is already being used by researchers and teachers around the world, with projects underway in Rome, Glasgow and South Carolina. Dr. Lach hopes that DH Press will give historians, teachers, researchers and others who might not be well-versed in computer programming or GIS a way to create complex maps with their data.